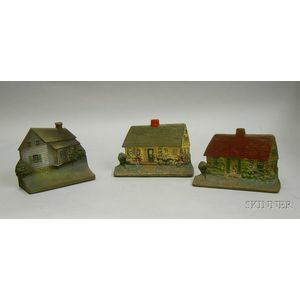 Two Painted Cast Iron Cottage Doorstops and a Bradley & Hubbard Painted Cast Iron House Doorstop. Stained Pine Dovetail-constructed Blanket Box on Turned Feet. Black and Green Striped Brown-painted Six-Board Chest.